Considering how much material that has been published (even from people who are not proponents) that is open to the so-called “aquatic ape hypothesis”, there have been relatively few “critiques” of it and none whatsoever of the broader, more modestly positioned “waterside hypotheses of human evolution”. I have always been as much fascinated by the criticisms of these ideas as I have of the ideas themselves and have made it my duty to read any critique I see with a critical eye and to critique the critique. Here are links to a small, but admittedly growing, list. Bizarrely, the one most students seem to be directed to is a web site written, not by a palaeoanthropologist, not even by a scientist, but by a lay person who just seems to have a chip on his shoulder about the idea – Jim Moore’s infamous “Aquatic Ape – Sink or Swim?” web site. This “Jim Moore”, by the way, is not the California-based “proper” anthropologist, Jim Moore, but just some guy who was married to the late Nancy Makepeace-Tanner. I wrote many pages on my previous web presence criticising his site but since it was attacked (coincidence, perhaps?) I have yet to find the time to rebuild it in its entirety – a work in progress, as they say. But here’s a link to what I’ve reconstructed so far. 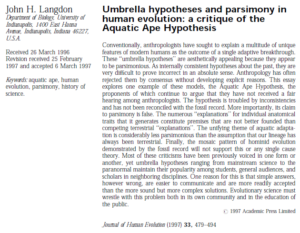 The most respected attempt at a critique of the so-called “aquatic ape hypothesis” is probably attributable to the University of Indianapolis anthropologist, John Langdon. He published a paper in the Journal of Human Evolution in 1997 critiquing not the “AAH” per se, he claims, but “umbrella hypotheses” generally. It uses straw man arguments based on cursory and superficial comparisons with truly aquatic mammals. Rather than give Morgan’s claims the weighting she gave them, 26 of them are paraded, in an equally facile way, as if for ridicule. The wading argument for bipedalism argument, for example, which Morgan wrote four chapters on in her 1997 book, was dismissed in one short, facile paragraph. It was not very scholarly. The Walkenburg symposium, and the proceedings from it (Roede et al 1991) were cited but not one of its findings was reported upon. The critique of the AAH was solely of one of Elaine Morgan’s books (1982). It placed the “AAH” under the same umbrella as pseudoscientific ideas such as Von Daniken’s “aliens from outer-space” and creationism. Although the comparison was made for effect, many others have repeated this slur since, perhaps getting their lead from Langdon.